For authentic North Indian cooking i refer to Suvir Saran's " Indian Home Cooking ". Prepared this simple matar ke chaat and loved it. I used frozen peas , think would be even better with the spring fresh peas . It is a wonderful snack and can be served with rice or roti too. I have modified the recipe a bit according to my families taste. Heat oil in a pan and add hing and then cumin seeds and cook stirring until golden brown. Add whole red chili , ginger and green chili and cook stirring for one minute. Add the peas , chili and salt and cook till peas are tender. Switch of the flame and stir in lemon juice and toasted cumin seeds powder. And now you are ready to serve. Peas look awesome. Great preparation & Pics. 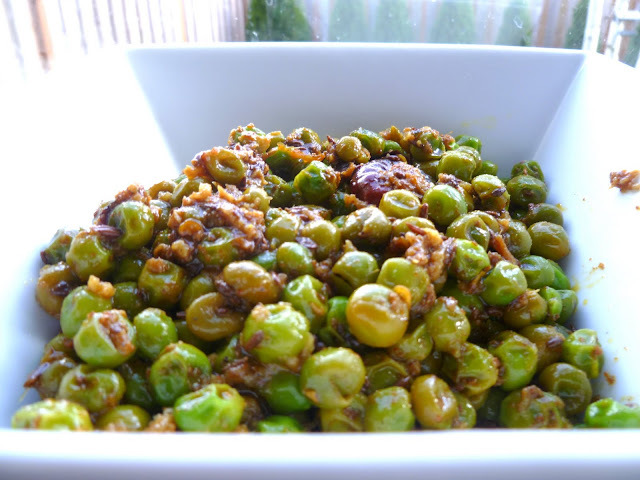 So yummy and delicious peas recipe,very easy to prepare. Wow, a simple yet delicious recipe,loved it. Looks yummo!! !I will make this soon as everyone at home enjoys green peas..
Lovely recipe dear...looks awesome,loved it,bookmarked. love to have this with chapathis..
Flavorful and yummy stir fry..looks great! Wow- that looks so tempting- great recipe! Mouthwatering dish, looks sooo irresistible..
i love green peas... absolute yumm curry.. Happy to follow u dear u hv awesome dishes.. Awesome recipe Nisha...the medley of spices in this is delicious. Delicious preparation, dear. Peas looks incredible in this method. First time here...the chaat looks really yummy!! !